1639/1645, CENTER CAP USED, 88-93, BUICK, REGAL, BRUSHED FINISH, DARK GREY THREE FLAG LOGO, PLASTIC CLIPS, 2-1/4" DIA. 1639/1645, CENTER CAP USED, 88-93, BUICK, REGAL, BRUSHED FINISH WITH BUICK DARK GREY THREE FLAG LOGO, PLASTIC CLIPS, 2-1/4" DIA. ORDER UNDER 1645 CENTER CAP FOR A 14" ALUMINUM, 8 SLOTS RIM. 1987, Hubcap, 15", 65, BUICK, LESABRE, 54 RIB TYPE, POLISHED OUTER RING, 54 SMALL SLOTS, BLACK PAINT BETWEEN RIBS, RAISED CENTER, PLASTIC CHROME RIBBED CENTER, BLACK BACKGROUND THREE FLAG LOGO RED,WHITE AND BLUE, METAL CLIPS. 4011, CENTER CAP USED, 06, BUICK, TERRAZA, MACHINED FINISH, RAISED RING, 3 FLAGS, PLASTIC CLIPS. 2-5/8" DIA. 4011, CENTER CAP USED, 06, BUICK, TERRAZA, MACHINED FINISH RAISED RING & 3 FLAGS, PLASTIC CLIPS. 2-5/8" DIA. FOR 10 SPOKE, BRUSHED RIM. ALSO FITS, 4013, 4025. 4060, 4063, 4094. 4012a, CENTER CAP USED, 94-96, BUICK, ROADMASTER, GREY BACKGROUND, CHROME WORDS ROADMASTER, CHROME RING, THREE FLAG LOGO, PLASTIC CLIPS, 7" DIA. 4012b, CENTER CAP USED, 94-96, BUICK, ROADMASTER, GREY BACKGROUND, GOLD ROADMASTER, CHROME RING, FULL COLOR THREE FLAG LOGO, 7" DIA. 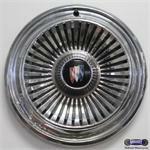 4020a-1, CENTER CAP USED, 16", 97-02, BUICK, LESABRE, PARK AVE, CHROME, RAISED 3 FLAG LOGO, 5 PLASTIC CLIPS & WIRE RING. 6-3/8" DIA. 4041, CENTER CAP, 01-03, BUICK, PARK AVE, OPT N73, BRUSHED FINISH, 8 SILVER POCKETS MATCH RIM, RAISED THREE FLAG LOGO, PLASTIC CLIPS, 6-5/16" DIA.